It’s nice to tour gorgeous, historic music venues, but it’s even more enjoyable to appreciate the interior while taking in a concert! 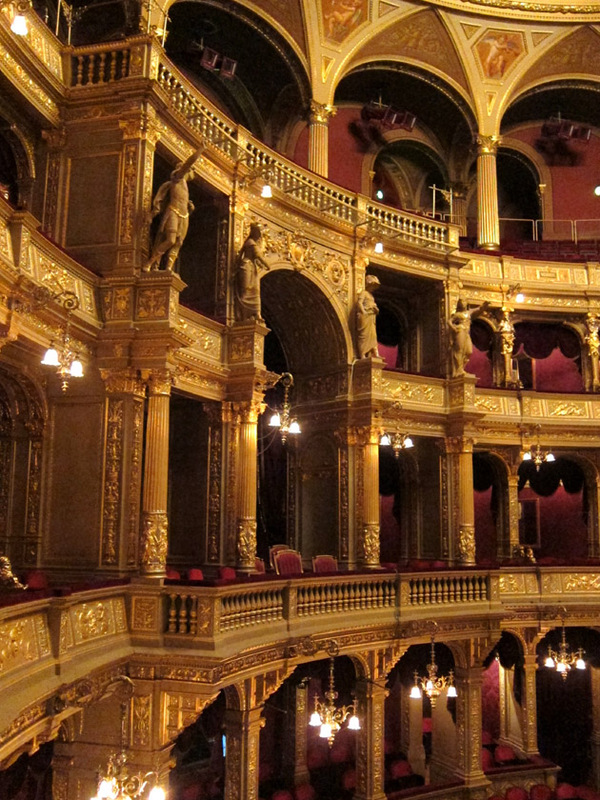 The Hungarian State Opera House in Budapest is a Neo-Renaissance masterpiece from the late 19th century (like many other architectural wonders in the city). With nearly nightly performances and very reasonable ticket prices, the Opera is a great way to spend an evening. Just make sure you leave plenty of time before and after the show to wander the elegant lobbies and corridors. 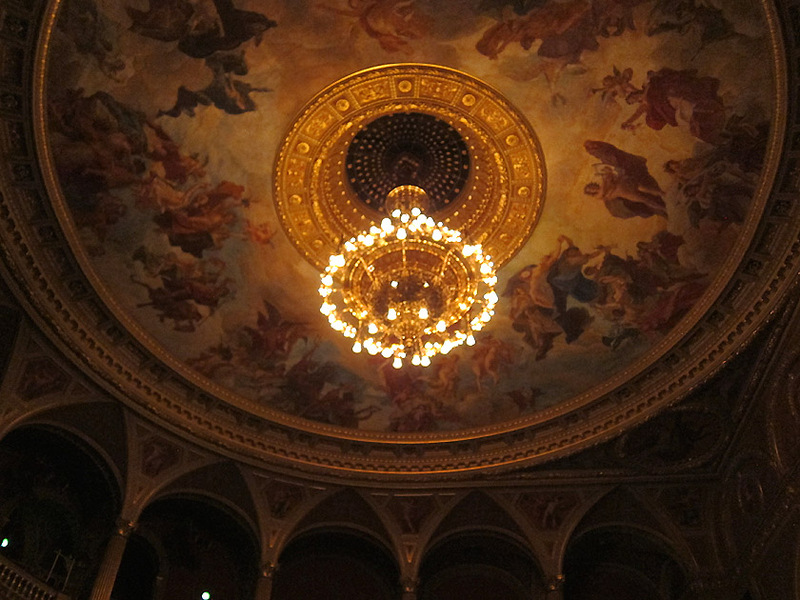 Empty seats and dimmed house lights in the Hungarian State Opera House after the concert. 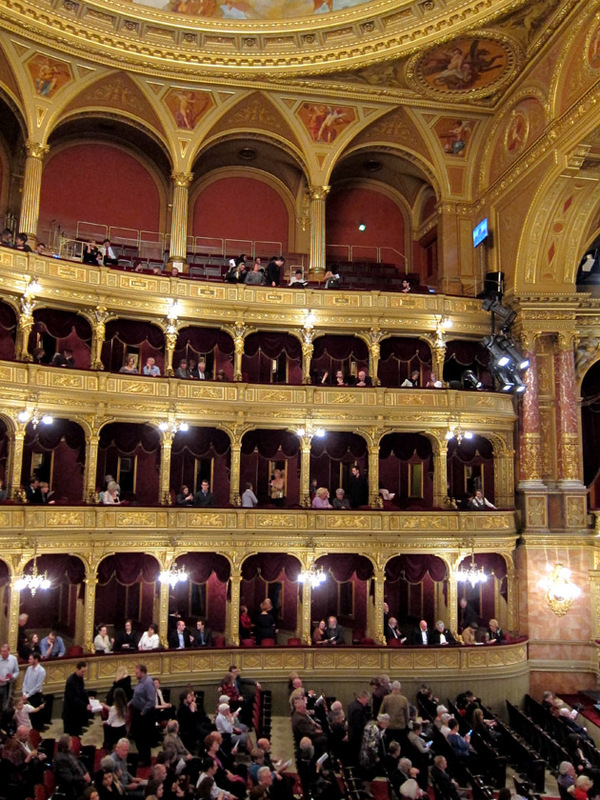 The Opera House in Budapest was completed in 1884. It was designed by acclaimed architect Miklós Ybl, known for transforming Budapest in the late 19th century thereby giving the city its elegant look. Emperor Franz Joseph’s only stipulation on the project was that the venue couldn’t be as big as the opera house in Vienna. 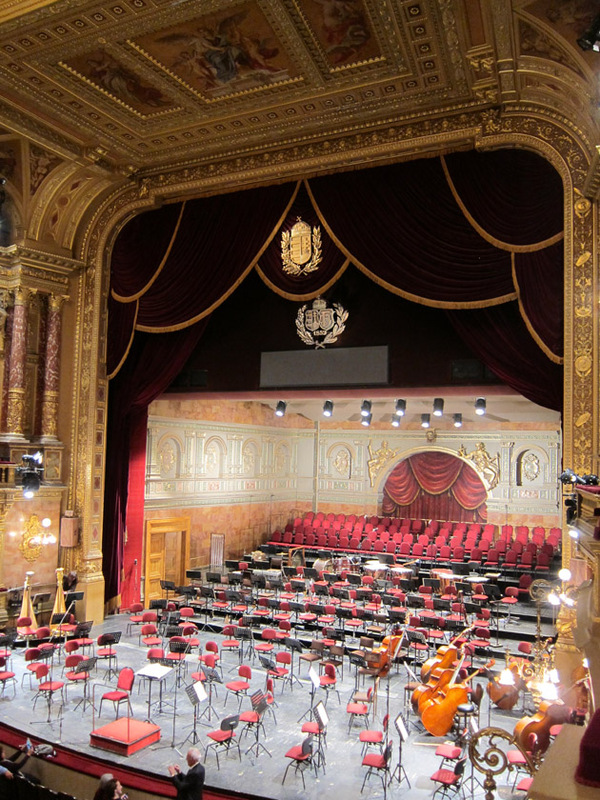 As instructed, the Budapest opera house is in fact smaller, but Hungarians claim that it is more ornate and more beautiful than the Vienna Staatsoper. Having been to both, I think the Hungarians may be right. 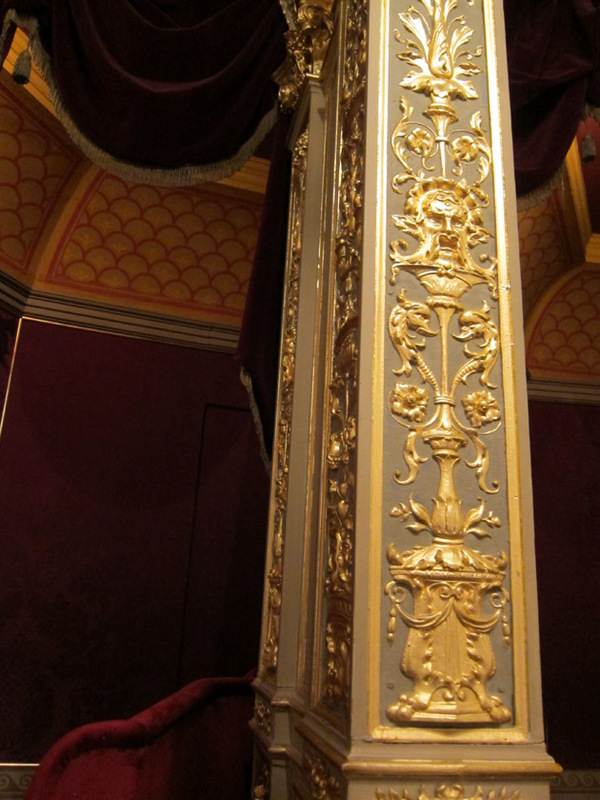 The theater is decorated in a Neo-Renaissance style. The columns, loggias, and grand staircase are well-ordered with the sort of symmetry and harmony you’d expect but with extra splash of drama. Painted and stucco grotesques and floral embellishments are used to decorate the interior. Within the foyers are grand frescoes of music personified, allegorical scenes, and portraits of Hungary’s great composers. All the gold walls and trim are off-set nicely by marble and wood paneling. Overall, there is definitely a high density of decoration which is reminiscent of the Neo-Gothic Matthias Church in Budapest renovated around the same time as the Opera House’s construction. Detailed black and white ceiling decoration above the outdoor portico along the front of the Opera House. While I was hoping for some Liszt, we heard a performance of Mahler’s Third Symphony. The music was excellent! The piece has some stellar solos including a section where a haunting trumpet performed off-stage. For the final movement, an alto soloist, a women’s chorus, and a children’s choir were brought on-stage. There were no intermissions in this 3 hour long piece which is a shame because there was a small table in our box and I think a champagne would have done nicely there. The stage is set for the evening’s performance. Our box seats were amazing! With a full view of the stage as well as the boxes on the other side of the horse-shoe shaped theater, I couldn’t help but imagine the social undercurrents and intrigues that accompanied being seen at the opera in centuries past. Guests arriving for the evening performance. 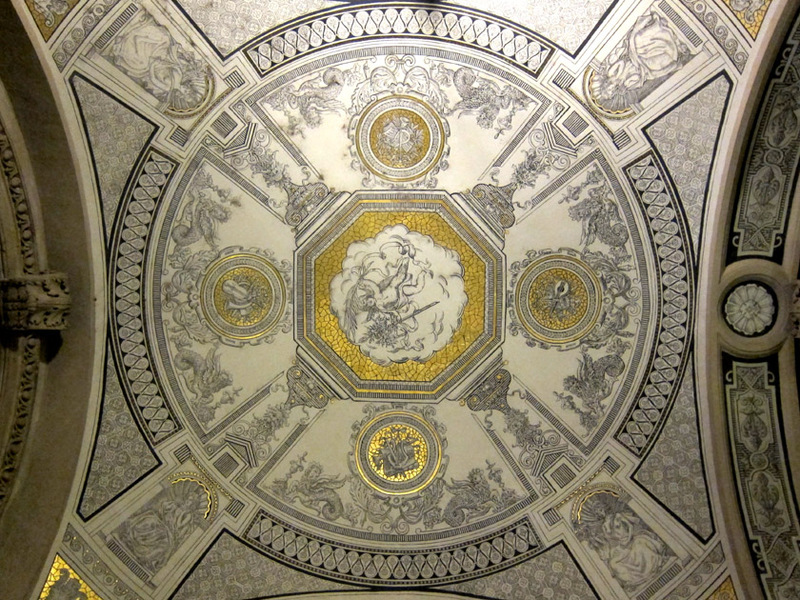 In the center of the ring was an over-sized royal viewing box decorated with the personification of the four primary vocal parts: soprano, alto, tenor, and bass. 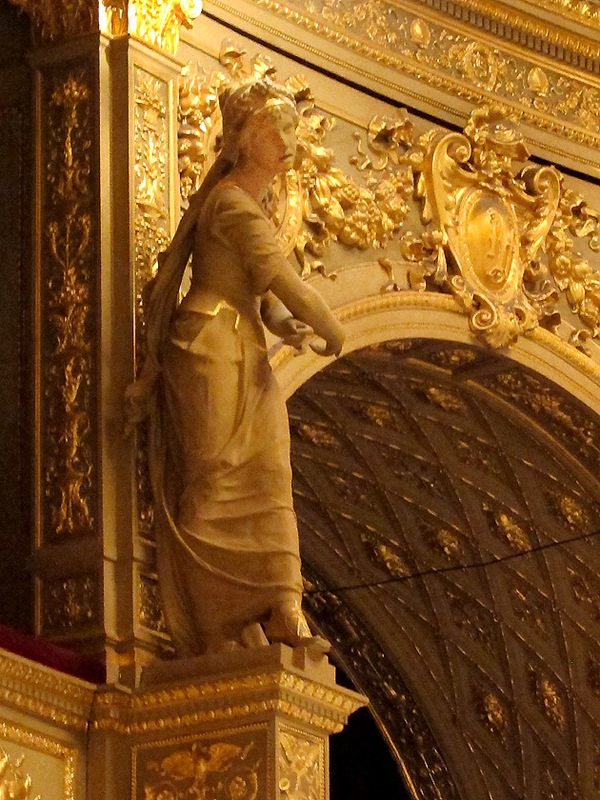 Given that she’s pointing downward, I think this is the alto statue. 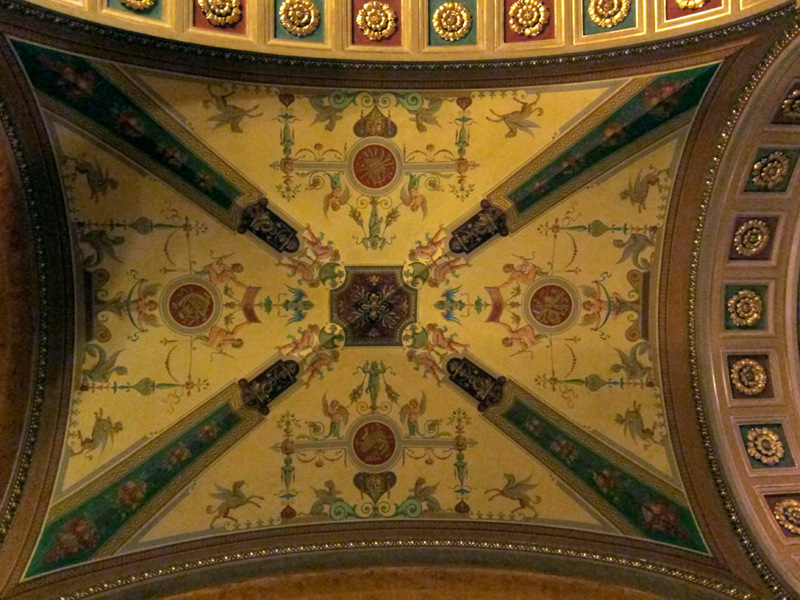 The ceiling fresco in the theater fittingly shows the Apotheosis of Music with Apollo on lyre in concert with the Muses and the pantheon of Greek gods and goddesses. 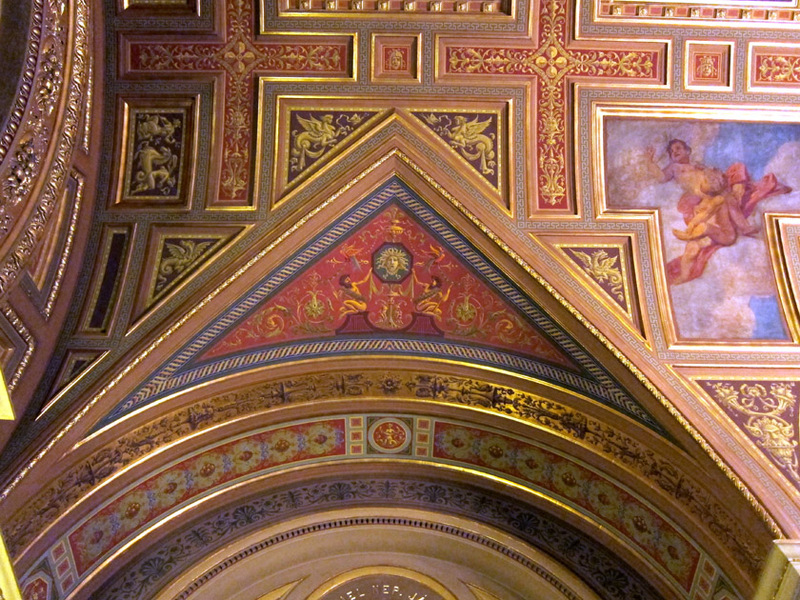 Ceiling fresco in the opera hall. Between the boxes were elaborate figural armrests. 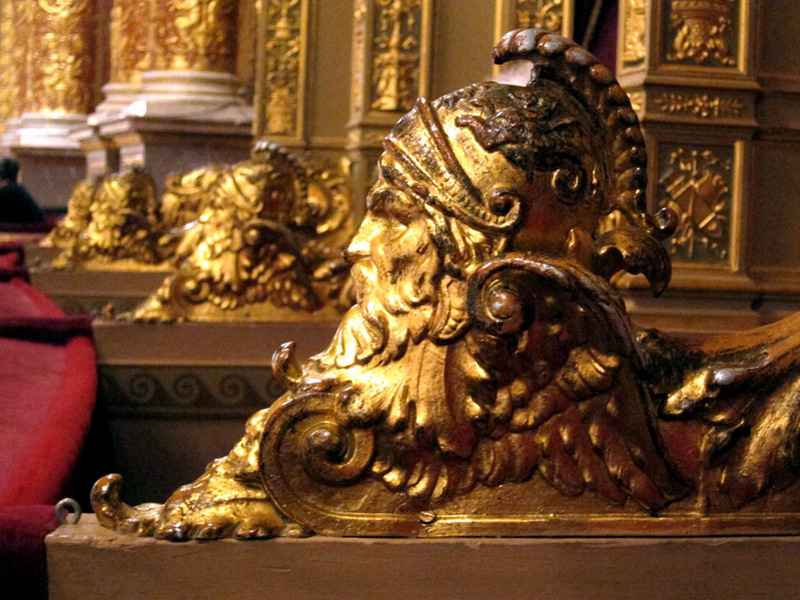 From decades of use, the gilding was worn off in places showing the rust colored layer used to fix the gold. Even that layer was worn off in places revealing the tin form of the sculpted element. Figural arm rest between boxes. Stucco design along the divider between boxes and the back of the movable couch in the box. The front of the each box on the first level contained a shield of two putti and a mask. 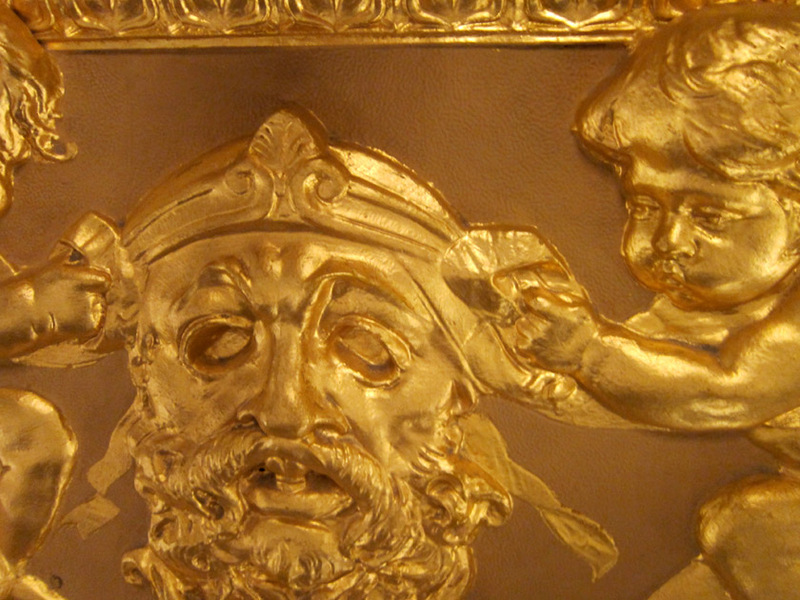 Mask and cherub detail from the front of the box. 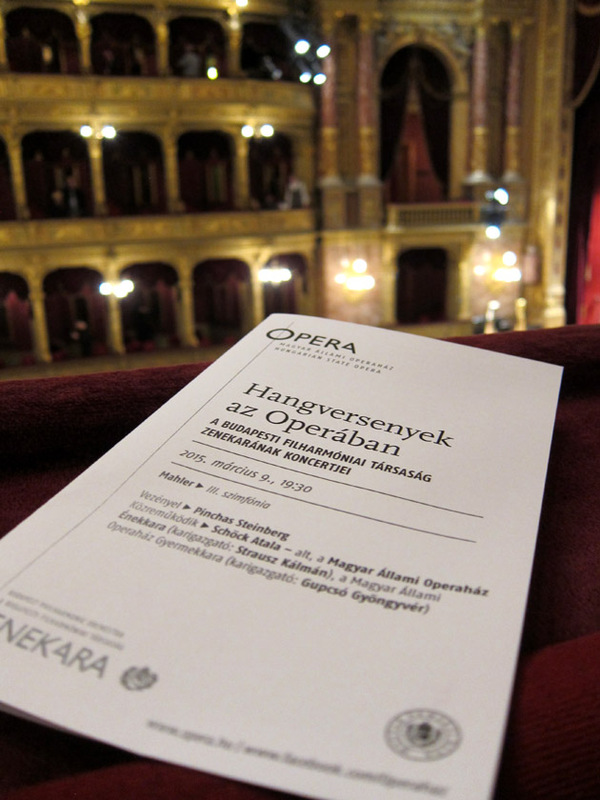 I definitely recommend visiting the Hungarian State Opera. 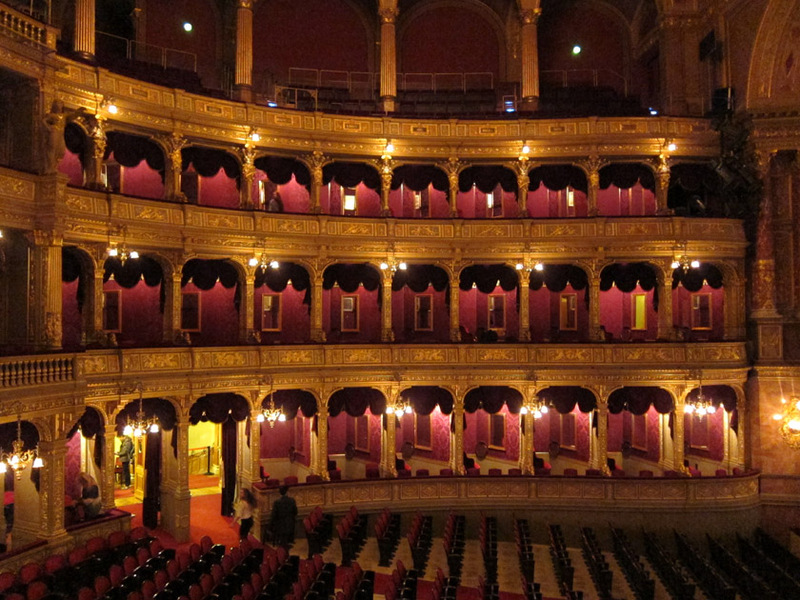 Seeing a concert or opera performance is simply the best way to experience the beauty of this theater. In some ways, the experience also takes you back over a hundred years to a time of great energy and creativity in Budapest. At the turn of the century, the city was a center for art, literature, and music. I cannot think of a better way to spend an evening in Budapest than to tap into that legacy through art and live music.